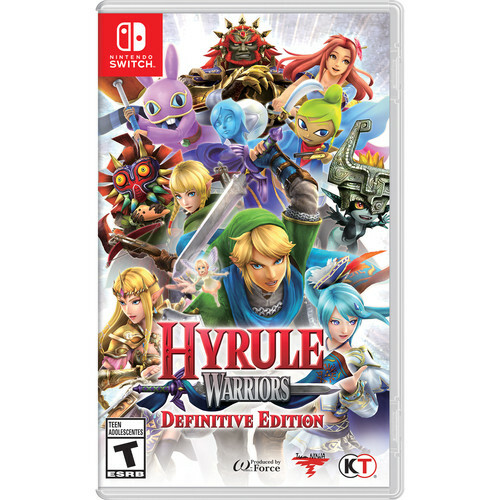 In Hyrule Warriors: Definitive Edition from Nintendo and KOEI TECMO GAMES, you can choose to play as a hero or a villain from the Legend of Zelda series. Advance the story to unlock characters, each with their own moves and weapon types. Collect rupees and other items to upgrade weapons and craft badges, which bolster your character's abilities. The Definitive Edition allows you to play in Full HD 1080p TV mode. All features and downloadable content from past versions of the game, including My Fairy mode and elements from The Legend of Zelda: Wind Waker, are in this version as well. With support for up to two players, you can team up with a friend to save Hyrule. Please note that a Nintendo Switch Online membership is required to access online multiplayer features.